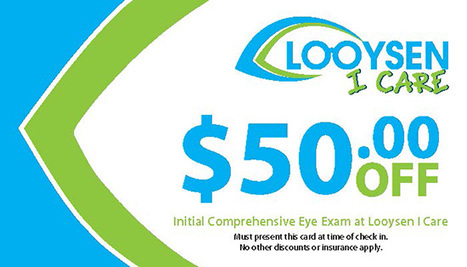 Looysen I Care will give you $50 off your first initial comprehensive eye health exam. Must present this card at time of check in. No other discounts or insurance apply. Call to make an appointment at either location. As a service to our existing customers, Looysen I care will take 30% off the total cost of your exam and refraction when paid in full on same day as service. No other discounts or insurances apply. When purchasing 2 complete pairs of glasses, the second pair of lenses is 40% off. When purchasing a contact lens package (1 year supply of contacts and contact solutions) and a complete pair of glasses, the contact lens package is 20% off.